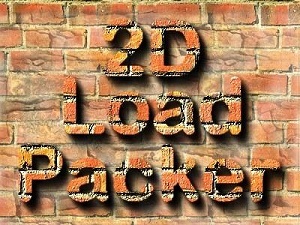 2D Load Packer (2DLP) is the unique space optimizer designed to help you plan quickly and easily the best compact arrangement of a number of different size 2D rectangular objects (hereafter referred to as "Parts" or "Boxes") within one or more 2D rectangular enclosures (hereafter "Sheets" or "Containers"). 2DLP is based on the truly two-dimensional original packing algorithm. Using 2DLP instead of 3DLP is preferable for real 3D load planning cases, which could be someway reduced to the "on floor" 2D arrangement of the individual or stacked objects. 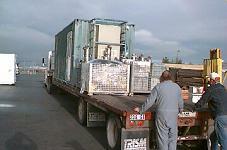 The overall load weight limit and truck axle weight limits can be taken into account as the additional constraints or actual optimization factors. The program has a facility for specifying the associated cost for each box (part) / container (sheet) item in order to calculate totals and affect the optimization as an additional priority factor. Optimizer goal and other main settings are adjustable. 2D Load Packer can be used to optimize multi-product load plans for any rectangular containers, trucks, trailers and railcars, as well as be applied to free type cutting, or any other 2D sheet layout planning or area optimization problem. The program can optimize over multiple containers (sheets) in multiple sizes at the same time, taking into account overall item set considered, as well as allowed item orientations specified for each item separately or for all together. Typically, optimizer reduces area waste by a factor of 2...3 with respect to manual load planning. Program run time is usually around 2...200 seconds and extremely depends on the number of items involved. In any case, it saves time and reduces the level of experience required for 2D layout planning dramatically. Using 2D Load Packer is easy. It is based on the full-featured database, allowing a user to pre-define containers (sheets) and boxes (parts) and to store the complete loading cases along with the corresponding solutions. To define a new task, you'd select a stored container / box items from the database or create a new object(s) by entering its sizes and other details via the user-friendly spreadsheet-type interface. Never enter the same information twice. The Task Page (see above) is the main program control center which allows you to navigate through the stored tasks, create a new task, activate optimizer run, review solution basic totals, clear solutions, modify any task initial data, resolve a task, and so on. The Image Page presents 2D views of the container (sheet) layouts and Area / Weight utilization diagrams. Layout patterns are displayed graphically as the complete adjustable full-color images. You can observe step-by-step load sequence and print any image view, as well as other task and solution data reports. Note that 2D Load Packer is intended for compact packing of any groups of identical items, as well as a large number of items having mostly different sizes when common loading by building simple rows of a large number of identical items is impossible. The Solution Page presents full solution information for a current task in form of DB tables. Program allows you to print complete reports containing all data you see. 2D Load Packer output data include overall solution totals: area / weight capacity utilization, area / weight sums and numbers of used items; and for each used container (sheet) separately: area / weight utilization, packed boxes (parts) kinds, quantities and other totals; and for each box within the container: 2D loading coordinates, orientation, and load sequence number. The Optimizer Settings Page allows you to control the basic optimizer and technology related settings – either common for all tasks, or task specific. Active settings are stored along with the task on each solver run. You can restore and activate these current task settings, or apply common or default settings by pressing the appropriate buttons, as well as adjust any of the settings separately. The system supports network data sharing and has some specific DB export / import facilities, allowing a user to exchange selected task / solution data with another 2DLP system. 2DLP Box Library can be populated by importing data from the appropriately formatted ASCII text file (or *.csv file), as well as by common "Paste from Clipboard" actions. 2D Load Packer can run on Windows 95/98/NT/2000/Me/XP/Vista/7/10.. (32/64-bit) on common PCs beginning with 486/DX4 with 800*600 or higher resolution monitor. Pentium III or higher and 1024*768 resolution is recommended for comfortable use. 2D Load Packer optimizer engine is also available in the form of batch processing executable program. Press here to download 2D Load Packer 30-day Trial or Free version. Press here to download 2DLP Help file (User manual, 115 KB).